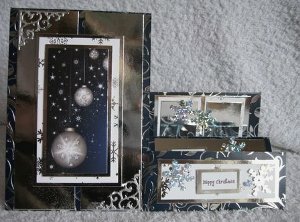 Try this Side Step Card for something a little different. 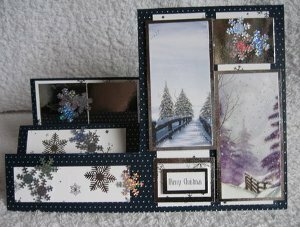 Not difficult to do, but this Side Step Card will make all the difference to your creations. For this project I would recommend that you make a Template before you start cutting up your good stuff. That way if you make any mistakes it's not the end of the world. But keep your template safe and then whenever you want to make this card again it will be there for you. Once you become confident with these cards you won't need all the coloured lines everywhere. 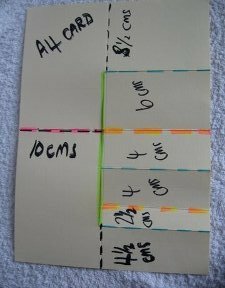 You will need an A4 card, your metal ruler and a pencil to make your marks. So let's measure the card as shown in the diagram. From the left side measure in 10cms. From the top measure down 8.5cms. From the bottom measure up 4.5cms. The diagram shows these as dotted black lines. Score these lines from the centre to the outer right hand edge, ready to fold. This panel will now be 16.5 x 11cms. and is where all the folds will be. Now working on the right side of the cut, and from the bottom 4.5cms mark, measure up 2.5cms. Then from that line measure 4cms, and from that line measure 4cms. And from that line measure 6cms. The piece to the top of the card should be 8.5cms. On the right of the photo, the blue are the mountain folds, and the orange lines are the valley folds. Fold the left of the card (pink line) to make a tent fold. Fold all the blue lines on the right of the card into mountain folds. Fold the orange lines into valley folds and your card will look like the one in the picture. And if like me you make your cuts back to front ...it really doesn't matter... just make your Side Step Card with your steps on the other side! 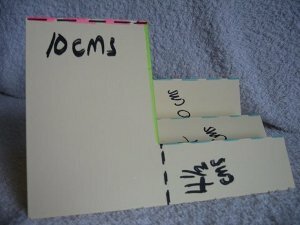 If you really like the look of Stepper cards but can't be bothered with all the measuring, then try this. This is a simplified version of the card. It's not as intricate but just as effective, and one you may like to try with children.